“My poor baby looks normal, but he regularly gets red spots on his body due to internal bleeding from a rare disease. Blood transfusions are keeping him alive for now, but his condition has become so worse that he is at a high risk of contracting infections even from these transfusions. Doctors tell us that even doing simple blood tests has become risky in his case. Only a bone marrow transplant can help him live – he needs to undergo this procedure as soon as possible. I want to help my baby live, but financially I have no means to save him.”-Hemachandran, father of 8-month-old Mirthun. 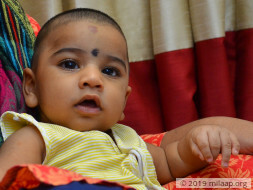 Deepa and Hemachandran considered themselves lucky to be blessed with a cute baby boy at the end of last year. But before they could fully bask in the happiness of being first-time parents, their baby boy started getting bluish bruises all over his body. It began appearing on his legs, and slowly started spreading to the rest of his little body. Thankfully, the baby had not been discharged from the hospital and the doctors began doing tests immediately. “Before I could hold my baby and nurse him to my heart’s content, he was taken away for tests. The doctors told us that he had low platelet count and low levels of hemoglobin in his blood. He underwent a platelet transfusion immediately. 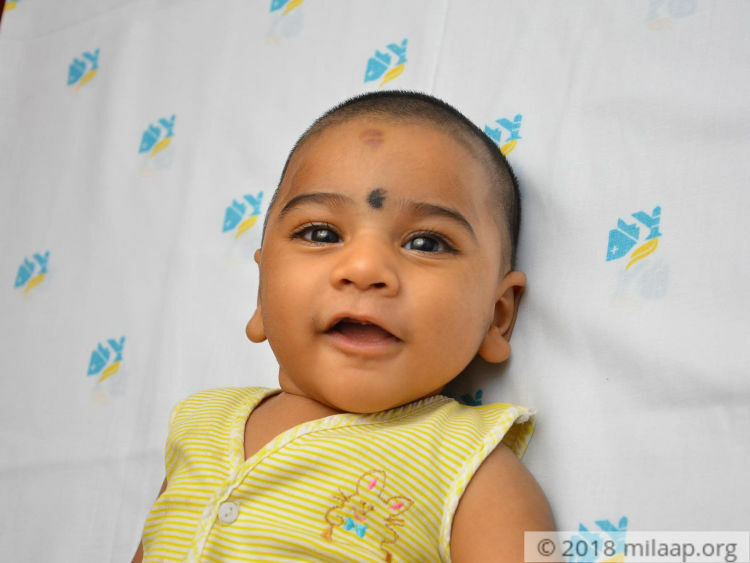 I was relieved when tests for blood cancer came back negative, but only later did we realise that it was something worse than that.”-Deepa, mother. Soon after he started bruising, Mirthun faced a dangerous life-and-death situation. He had to be rushed to the ICU because of bleeding in his brain and was admitted in the hospital for more than 45 days. His parents did not have any hope that he would survive. However, this little fighter’s body did not give up and he soon recovered from it. “Our prayers were answered when the doctors said that he had survived the bleeding. Our lives were at a standstill during those 45 days – all we did was wait anxiously outside the ICU and worry about our little baby who did not deserve such a cruel fate. Knowing that there is very little you can do to help your baby is the worst feeling that a father can possess.”-Hemachandran. Every two weeks, Mirthun’s body shows clear signs that he needs a blood transfusion immediately. Apart from red spots all over his body, he gets red-colored thickenings on his mouth, because of which he cannot eat anything. These are signs of internal bleeding caused by the sudden drop in platelets. He also gets increasingly irritable and has trouble sleeping at night. “All Mirthun does is cry uncontrollably when his blood levels drop. Nothing can console him – even my embraces only seem to cause more discomfort for him. He becomes so weak from all the wailing that he even gets recurrent fevers and needs antibiotics. It is unbearable for me to watch them put a needle into his small arm – sometimes the vein is not spotted easily so he gets pricked over and over again. I just want this horrific ordeal to end – no baby deserves this kind of pain.”-Deepa, with tears in her eyes. 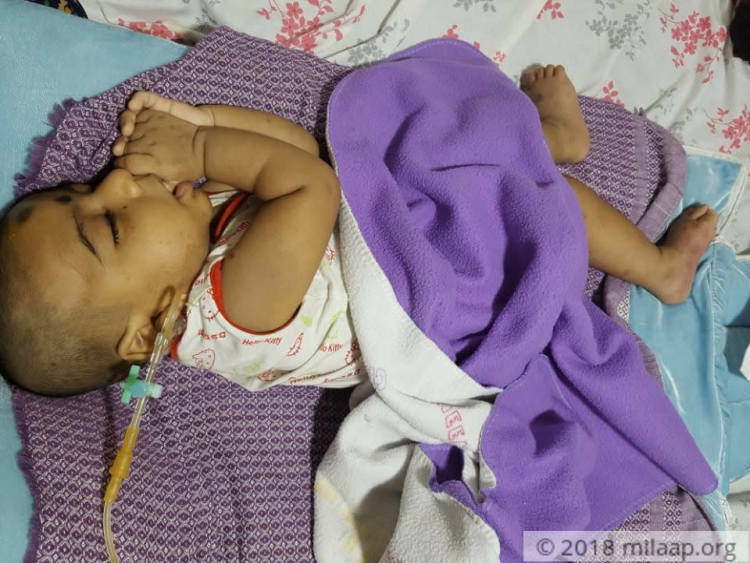 It was after a series of tests, including a bone marrow inspection that Mirthun was diagnosed with a rare disease called Congenital Thrombocytopenia With Radio-Ulnar Synostosis. This is a condition where the body has abnormally low platelet count, leading to complications like internal bleeding. In Mirthun’s case, this disease is even more serious because his bone marrow is very weak. This means that along with platelets, the count of white blood cells as well as red blood cells drop drastically in his blood. Blood transfusions will not suffice in the long run as his body is extremely susceptible to all kinds of infections also now. 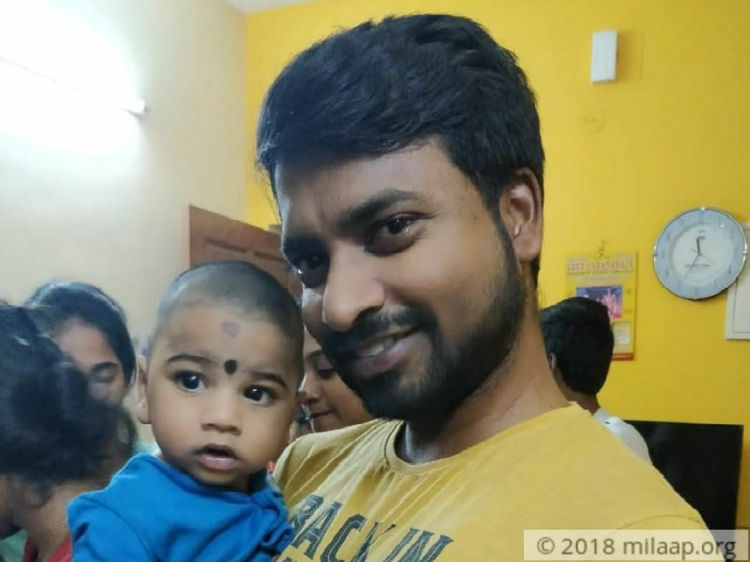 Hemachandran works in a private company in Chennai and was able to manage expenses before his son was diagnosed with this life-threatening illness. He has been irregular to work ever since, resulting in loss of pay. He has also borrowed heavily for his treatment till now and is in no position to beg for money anymore. 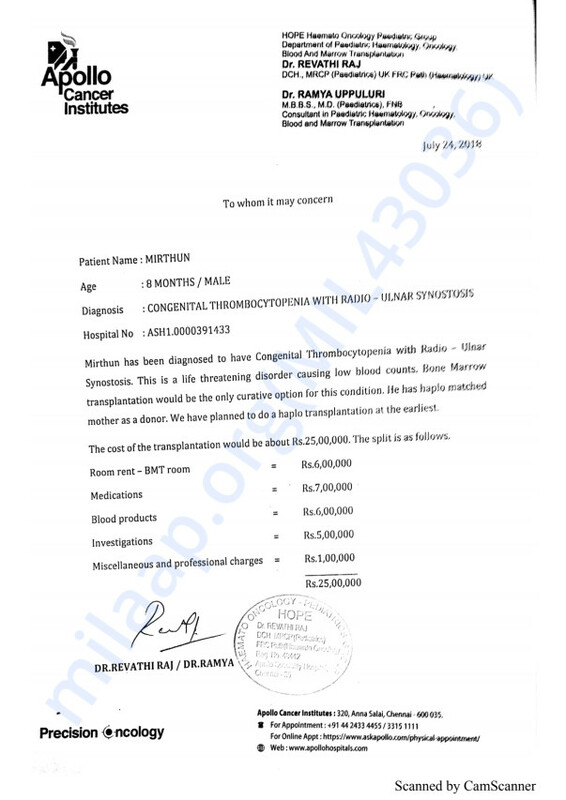 Now, he is unable to arrange funds for Mirthun’s regular transfusions, let alone his bone marrow transplant. Baby Mirthun has only known a life of needles and pain since he was just two-days-old. His compromised bone marrow is causing a dip in the production of platelets in his blood, white blood cells and red blood cells as well. Regular blood transfusions were keeping him alive till now, but even they are not enough to prolong his life because of the high risk of infections. He cannot live for much longer without a bone marrow transplant. His father, Hemachandran, has used up all his savings and even borrowed heavily for his treatment till now and does not have other financial options to turn to. He needs your help to save his baby. With a heavy heart, I regret to inform you that Mirthun is no more. He was supposed to survive the Bone Marrow transplant for 100 days. However, recently he had high fever up to 105 degree due to which he couldn't survive despite doctors best efforts. The funds raised will be utilized to clear his medical dues. Please pray for his soul to rest in peace. Thank you to all of you for the immense love and support. Thank you for the wonderful support you have shown towards Mirthun. Currently, he is at the hospital and doing fine. He has responded well to the treatment. There are minor side effects for that doctors have prescribed medication. However, his blood count is still low, doctors are waiting for blood count to increase so that they can schedule the surgery at the earliest.